Here in Houston and our surrounding region, many homes are built upon a pier and beam foundation with a crawlspace beneath the structure. Any moisture lingering in the crawlspace can promote the growth of mold in the decking and flooring above, as we have seen many times. 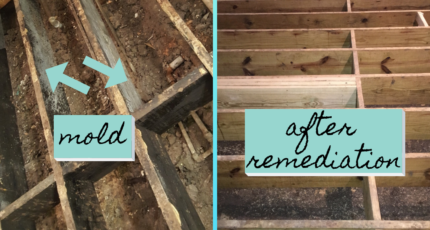 Recently, we restored the joists and other boards at the base of a house that had become moldy. The mold had spread to the floors, which started to warp and cup under the residents’ feet. “This particular house was built with a very small crawlspace underneath – with only a little more than 1’ of clearance above the ground,” Green Star Eco Services president Marc Patel said. Standing water would pool underneath and eventually the floors buckled. In addition, mold was growing on the support beams and joists, he added. Usually, we can crawl under a house to reach the crawlspace and treat the affected areas. In this case, the floors were removed and then we treated the beams and joists directly. “The joists were saved by our mold treatment. The wood is now in very good shape. The floors were replaced,” Patel said. The affected areas were sprayed with our proprietary antimicrobial treatment and then dried. We then wiped down surfaces with the sanitizing treatment solution and used a HEPA vacuum to remove any lingering mold spores. Then, we used dehumidifiers and air purification units to clean the air. To ensure the job is done, an independent third-party mold assessor will test for the presence of mold. Once the green light is given from the mold assessment company, the rebuilding with new sheetrock and flooring can proceed. To prevent further issues with excessive moisture in the crawlspace, drainage has been added to divert the water from under the house and ventilation, fans and a sump pump have been installed. In Houston, new pier and beam residences and other structures need to be built two feet above the flood level in the 500-year flood plain. This ordinance was adopted after Hurricane Harvey and is meant to keep people and homes out of harm’s way during tropical storms. The extra headroom for crawlspace might also keep moisture from getting trapped under a home. Pier and beam, also known as block and base, is a very traditional building style in the Gulf Coast region and might make a comeback over slab foundations, especially in flood-prone areas. We often see mold in crawlspaces and attics, especially as the climate in southeast Texas and the Hill Country is hot and often humid and prone to torrential downpours. It is essential to control humidity inside a house as well as within the crawlspace and attic. If mold does develop, we can safely treat it with an eco-friendly, anti-microbial sanitizer and restore your peace of mind.